One thing I *really* like about the RV lifestyle is that, when you’re on the road, you definitely *get* that every day counts. If we’re visiting an area where we have friends, we make sure to visit those friends because we know that we’ll be on our way again in a few days. Every day counts. When we stayed at Hart Ranch near Rapid City, SD this summer, I wanted to go for a hike in the Black Hills. We didn’t just talk about it, we did it. We had a memorable day hiking up to Harney Peak. We had to squeeze this in due to all the work we had to do on our website and rally preparations, but we did it because we only had a week there and every day counts. 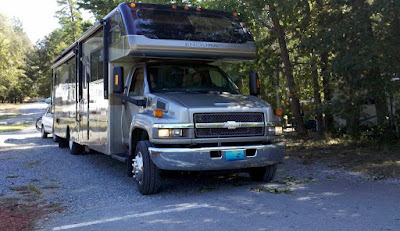 Now we’re parked in our RV site where we intend to spend the whole winter. We’re at Paradise Island in Fort Lauderdale, Florida. 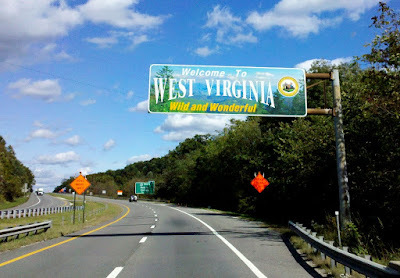 This is home for us, all our family and lots of friends are here. Since we plan to be here for nearly 6 months, the pressure of making every day count is gone. We’ve been here over two weeks now and still haven’t seen the beach! Time just slips away. I usually post to this blog at least twice a week, yet I see it’s been 2 weeks since I last posted! A couple of days ago I went into the office of our Credit Union to make a deposit. I usually do this by mail, but I find it a treat to go into the branch office. Jessica has handled our accounts for years so I stuck my head in her office to say Hi! She asked how our summer was and it took me a while to give her just the abbreviated version. She said she couldn’t believe we had been gone 6 months – it seemed like just yesterday to her. It seemed like years to me. It’s not that being in one place is bad … actually, I think we may have been a bit exhausted from our wonderful summer. It’s been nice to settle in and calm down. But, now I need to fight against getting too calm! Not only has it been two weeks since my last personal blog post – it’s been two months since I last published our Geeks on Tour Newsletter. Ok – gotta get to work! We’re back in Fort Lauderdale. This is our fourth winter in a row that we’re staying at Paradise Island RV park and Jim is working in the office in exchange for our site rent. We had a fabulous summer. Now we’re back to being settled in. That’s kinda nice too. We have the best of both worlds with all the travel in the summer, and a home base in the winter. For example, I’m looking into going to a ‘Curves’ exercise place 2-3 times/week. We already have dinners with friends planned for several nights next week, and of course, we get to visit with family and take care of obligations. Here’s our site at Paradise Island. And, oooohhhhhh do I love our new RV even more now. I always said that the smaller rig (30 ft class c , no slides) was a wonderful size as long as you were traveling. But, the longer you’re parked somewhere, the smaller it gets! Now with our two big slides and the great office furniture – I am very content. This is a comfortable house. I have a friend in St. Marys, Georgia that I've been wanting to visit for a while. Whenever we come back to Florida, I plan to stop in St. Mary's Georgia - but we never do ... till now. Barbara Ryan publishes the magazine, St Marys Magazine. 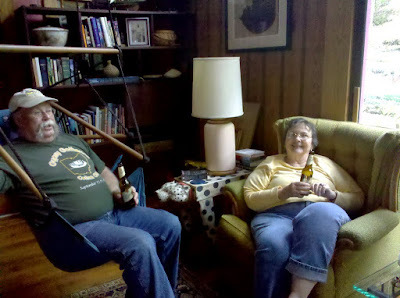 We only had 2 nights here, so I was thrilled that Barbara was able to get together with us for Happy Hour on Friday night. She says that when she first visited St. Mary's about 8 years ago, it felt like she was getting a great big hug. She found herself buying a Bed and Breakfast and moving to St. Mary's in short order. And I can see why. It's just north of the Florida/Georgia state line on the coast. Cumberland Island is a barrier island that protects from major weather. It is a small town where she says she can just drive her golf cart any where she wants to go! On Saturday we took advantage of the ferry over to Cumberland Island National Seashore. That's got to be one of the most beautiful days we've spent in a long time. The weather was overcast, and we were worried about rainstorms, but it turned out to be perfect. If the sun had been shining, it would have been too hot. We took way too many pictures to lay them out individually here, so I put them in a slideshow instead. We've had perfect traveling days these past few days. 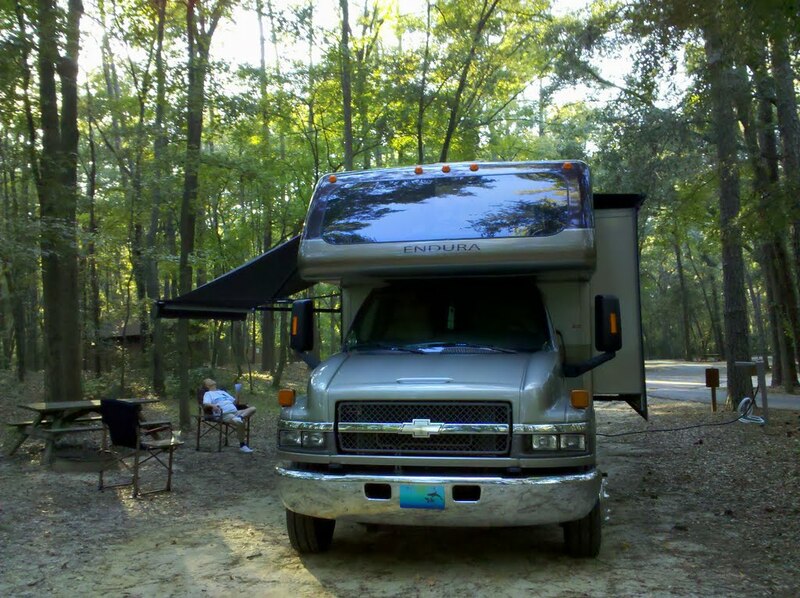 Beautiful campgrounds, nice walks, nice dinners, wine etc. Then on to South Carolina and a State Park called Colleton. Now we're on to Crooked River State park in St. Mary's Georgia. We have reservations to take the ferry ride over to Cumberland Island tomorrow. Our first stop after leaving the Gypsy Journal rally in Celina, Ohio was in Louisville, KY where we planned to pick up Mom from the airport. Our friend Dee flew with her, then went off to visit a cousin in Louisville. When we picked her up, Dee said that Mom had tripped and fallen on a curb when they arrived at Fort Lauderdale airport and Mom's rib was quite sore. We spotted a Health Clinic/Urgent care facility on our way back to the campground and took her in for some X-rays. Any time we've needed to use a walk-in clinic on our travels, I have been impressed and this time was no exception. They were efficient, friendly, and took the time to listen. The X-rays showed no fracture, so they prescribed Extra Strength Tylenol and rest and sent us on our way. So, all is well, but we arrived back at the campground after dark. 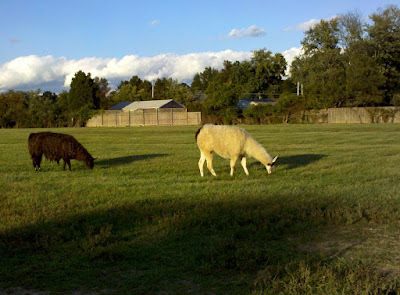 I was so hoping that Mom would get to see the Llamas that she had met before at Grandma's Campground one other time when we flew her out of Louisville. I did get a picture of the Llamas earlier that day. Sunday we took off - headed toward N Carolina to visit our old and dear friend, Emily. Beautiful scenery driving thru the Appalachian mountains. We were hoping to park our motorhome at Emily's and have a longer visit, but the last half mile of the road is not paved or graded. They take their truck up it all the time, but no way we could take Big Boy up that stretch. Even the paved road up to the bottom of their hill was a bit of an adventure in a large motorhome. We did unhook the Honda and drove up to the house to visit a while. Donovan in one of the comfy hanging chairs, surrounded by Emily's paintings. Donovan is an artisan who makes custom moccasins for Catskill Mountain Moccasins. He sells them at Rennaissance Faires across the country. Jim in another hanging chair and Emily looking just as content as her cats! Plan B was to go to a local State Park, so we took the Honda over Hanging Rock State Park to check it out. Although beautiful, it was just a little too snug for comfort to take Big Boy there. Yep, that is a drawback to having a wonderful big rig. In our older, smaller motorhome, this park would have been great. Everything is a tradeoff. So, after a short visit, we head out on the road again because we did have a Plan C - there's a Thousand Trails park just south of Winston Salem called Forest Lake. We knew we could get there before dark. All is well, it's a beautiful park *and* it has a hot tub. The Gypsy Journal Gathering is one of our favorite RV rallies. It's small enough that you can almost meet everyone, yet big enough that there's a lot going on. It also has an emphasis on education so you can choose from seminars on RV issues like water filters and tire maintenance or RV lifestyle topics like traveling to Alaska or staying at Harvest Hosts locations, and of course Geeks on Tour computer seminars. That's where we come in! In addition to all the seminars there's a lot of fun too. We've been coming to this rally for several years now, so it feels like a family reunion with all the friends we get to see. 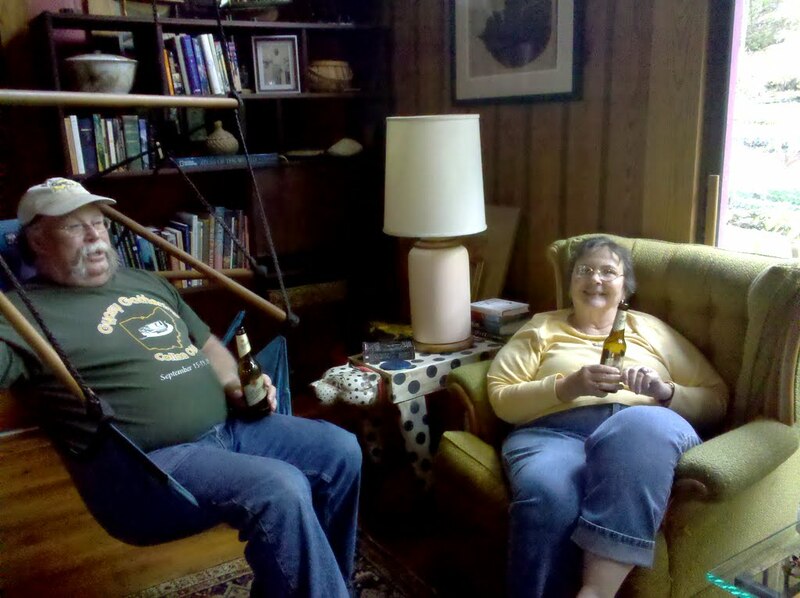 We were especially happy to see John and Jean Watson - who we've known since our very first days of RVing and going to Datastorm Users rallies. Jean has agreed to help me with some maintenance work on our websites - stuff that has gotten out of date, and I just don't have time to go fix. It was really good to spend some time with her in person to work on the website since most communication will be online. Thanks Jean! We presented 10 seminars in 3 days. Yes, we are exhausted - and we loved every minute of it. Here's Jim teaching GPS navigation and Trip planning systems. The most popular class was Facebook. It is such a great way for RVers to keep in touch with family, friends, and other RVers. We even taught one new class that we hope to repeat many times now ... it is on Smart Phones. We were pleasantly surprised to see the great majority of the attendees had Android-based phones since that is what we have to demonstrate although we had the iPad hooked up to the projector and were prepared to show some of that. We showed the anti-virus app we used and reviewed some basics like how to 'reboot', selecting Wi-Fi or 3G, understanding Airplane mode, camera settings like flash, auto-focus, and location storing (geotagging.) Then the fun stuff like dictating messages rather than typing, and voice search for navigation. I think we're going to find lots more to teach in this class! And, we may find that we can just call it Learning the Droid if future audiences are as skewed as this one was.